There is no bad version of Darkest Dungeon, but playing on the Switch might be the best way to play the upsetting medieval stress management sim. The Switch’s controls elevate the game into the best version of itself and make me a better player. There are very few things about Darkest Dungeon that I dislike, but I sometimes bristle at the amount of information the game gives you. When you’re keeping track of a dozen adventurers with their own frustrating quirks, it can be easy to get tired of clicking through menus and squinting at a screen. This is a game that begs to be played in long sessions, and sometimes sitting at a desktop with an aching back doesn’t cut it. It’s easy to feel defeated by not knowing where the thing I want is on the screen, rather than by the ailments and quirks of my party. 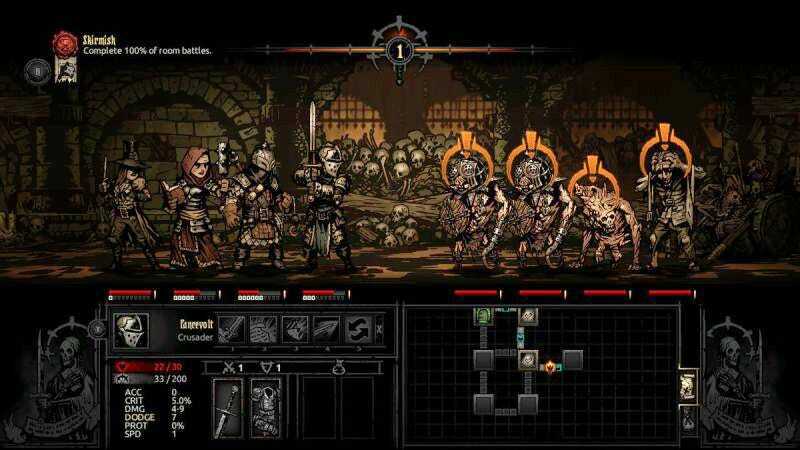 I imagine players who have checked out Darkest Dungeon on tablet already know this, but not only does the game translate well to a smaller, handheld screen, touch controls are a great way to navigate it. In the dungeons, you can tap on characters to select them and then tap on their attacks to use them. In the hamlet, you can tap on each location to bring up its menu, and then drag your adventurers into the slots at the bar, blacksmith, or wherever they need to go. There’s something about just using your fingers on Darkest Dungeon’s interface that makes it feel less intimidating. There’s still a density of information, but instead of scrolling through options in a nested menu, you’re just touching stuff. What makes Darkest Dungeon on the Switch ideal isn’t just the touch controls, but being able to switch between touch screen controls and the Joy-Con at will. There are times when using a controller to navigate your options just make more sense. In the dungeon, you can select which room you’re going to by flicking a direction on the right stick, and then move your party forward by pushing the left stick. But if you see a trap or need to loot something, you can switch right into using the touch screen. When you get back to the hamlet, you can double tap on a character to see their stats, and then hit the right shoulder button to see your quests. The feeling of being trapped by having to juggle all this information melts away pretty quickly. II found that I was keeping better track of my resources because the controls felt faster and made more sense. I suspected that when Darkest Dungeon hit the Switch I would never stop playing it, and so far I’ve been right. Last night I played in bed until my Switch battery ran out. It’s also been awfully tempting to pick up the two DLC for the game on Switch. It’s not just the best set of controls for Darkest Dungeon, it’s a control scheme that has changed the way that I approach the game. I stay in dungeons longer because I’m more confident about my abilities. I play better, which means I take greater risks. My dungeon runs are more successful, which isn’t necessarily great for my characters’ mental health (I’m sorry, y’all). Ultimately, this makes the game more fun—if you’re the kind of person who loves watching your party members die, fall ill or lose their sanity, that is.